All of that was true until 3 years ago. In a previous post, I talked about how I changed my perception and start speaking in public. When I wrote that post, I knew I wasn’t accepted to the OOW conference as a speaker. It wasn’t official but the catalog was starting to fill and I knew that the user group sessions (which I hoped to appear on) were selected. I congratulated couple of friends that were accepted but that was it for me. Then, something incredible happened: I got the email that I was accepted after all – and I will be talking in this year’s conference. Okay, so we talked about the “duties” of going to the OOW – what else did I learn from my 2013 experience? First, sessions aren’t everything. Yes, the sessions are a big part of the event, and we can learn a lot from them – but even though the sessions fill most of the days, the main event happens outside – in between and after the sessions. This time I plan to go to a few sessions, but not as many as I did back in 2013 (planned 25, attended 19 sessions, and can’t remember a thing from them). Here are few things I hope to do while there. Demo ground – the demo ground are where Oracle product manages and developers are talking about their babies (well, not their actual babies – their products). These guys who are not available for questions and inquires during most of the year come out from beyond their screen and meet their users. Last time I was there, I was too afraid to go talk to them – but this year I think it will be different. Partners’ Exhibition – unlike the demo grounds, the partner exhibition is where business is made. This is the place to hear about new products, new approaches, and the trends. This is the place to see what everybody else is doing and make some new networking and new connections. Last time, I wasn’t focused – I was too busy taking swag to listen to the people. This time – I hope to achieve more from that. Networking at the OTN activities – I’m not sure how, but last time I missed the OTN area all together. I discovered it on my last day and didn’t had the chance to enjoy it. This time I hope to spend more time at those activates. There is a welcome event on Sunday (1-5pm); there is a community meetup on Monday, and there is a Blogger meetup on Wednesday. The ACE dinner – I heard so much about this event and the connections that are formed there, that I can hardly wait. I must go shopping or else my wife won’t let me back in the house. 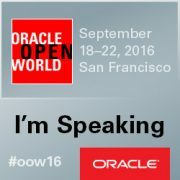 What Do I Hope to Gain from OOW? Eventually, the biggest thing I hope to achieve from this event is the same thing I wish to achieve in all user group events: networking. I wish to meet new people, make more connections, to get familiar with some of the biggest names in my industry. 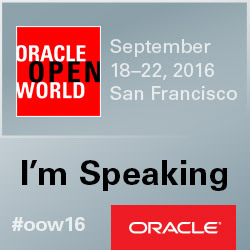 In the last few user group events, I made huge progress with that – and I hope the OOW expectations will not fail me. It’s going to be fun, it’s going to be intensive – I don’t have time to travel around so I’ll have to be focused. I really hope to blog from the events – but if not, I’d probably tweet from them so you can follow me there if you’d like (@realmgic). 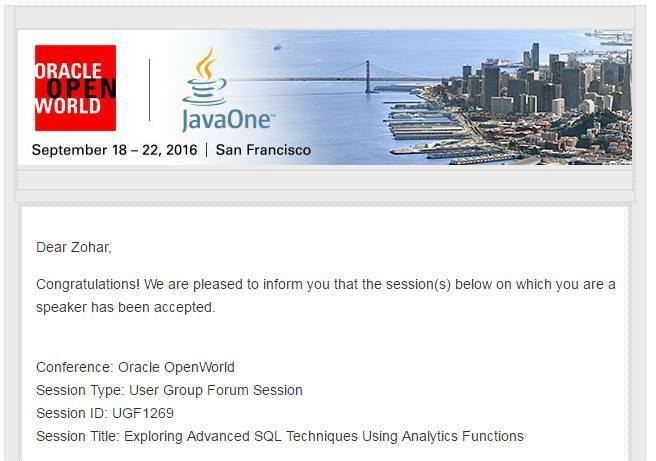 See you in San Francisco for #OOW16! I think that I’m missing one word here… FUN! It is definitely going to be fun!